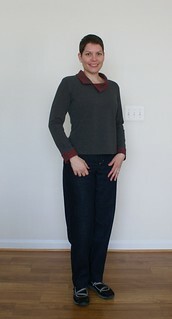 The fabric is a nice heavier weight 100% cotton denim from G Street Fabrics in Rockville. It’s like denim used to be before manufacturers started adding lycra and polyester. I’d bought the last two yards on the bolt and after wearing the jeans, I was hoping to buy a whole bolt of this fabric but no luck. When we went back to G Street, all their black denim was the stretchy stuff. Oh well. I’ll just cherish this pair. See the embroidery? I had fun with the back pockets. I used a design that came with the Bernina embroidery software. 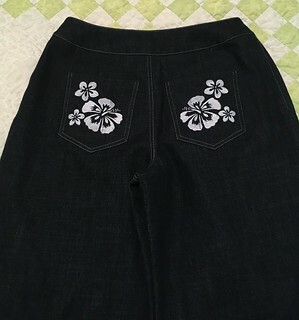 While looking for just the right design to put on these jeans (inspired by the hibiscus flower decals on my machine), I also took a few hours’ detour into organizing all the designs into folders to make future searches easier. Yay! I covered the back of the embroidery with a layer of stabilizer before sewing on the pockets, to ensure I wouldn’t snag the threads with my fingernails. That was an issue the first time I embroidered back pockets on jeans and a good learning lesson to remember. I found two of my old labels and sewed one in. There should be an almost full box of them somewhere still but I think they disappeared in one of our moves. I haven’t seen the box in years. Isn’t the label neat? And that’s all I have about these jeans right now. Stay tuned for the next post about the top I’m wearing in the pictures above. 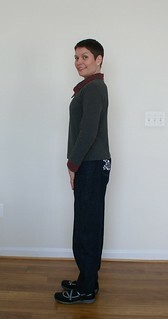 This entry was posted in sewing and tagged BWOF, jeans. Bookmark the permalink. Your jeans look great. 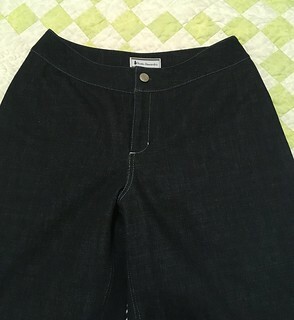 I have 2 of CKlein’s jeans patterns. Need to dig them out – Like the pocket design. Thank you, Marcia! Please share pictures if you make a pair with one of your Calvin Klein patterns. Those pattern envelopes bring back such fun memories. Alexandra, the jeans are beautifully made–your topstitching is perfect! The label does look nice and the jeans are very, very nice! I have to say, I LOVED my Calvin Klein Jeans, they were big in the 80’s. I do have a pattern, and a pivot and slide alteration will take care of any rise problems, but I do prefer a natural waist or just a bit shorter. Those Calvin’ fit me better than any other pair of jeans. I’m bigger now than my size 6 days, but I can work it out.